Professional Guttering & Roofing Service specialise in all types of roofing, property construction and maintenance work. Our roof work includes repointing of chimney stacks and walls. 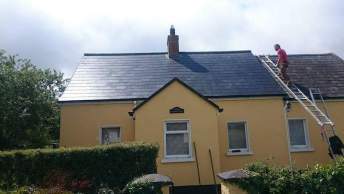 Replacement of roof tiles, ridge tiles, slates, roof valleys and battens. We use newest felt technology and high tech breathed membrane roofing systems. Our approach involves working closely with our customers using materials of the highest standards. Check work gallery to see our impressive track record for completing jobs on time and on budget, for quality workmanship and for trust and reliability.